The prior of the mausoleum where Spain’s fascist dictator Francisco Franco is buried has rejected any exhumation of his remains, the Spanish government said on Thursday, in the latest stumbling block to a divisive project. The grandiose monument carved into a hillside near Madrid is managed by Benedictine monks and the government is pressing the Church to lean on the prior to change his mind. 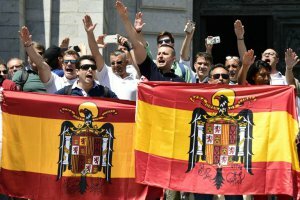 It said in a statement it had anticipated the rejection from a man who was once ‘a candidate for the 1993 general elections and the 1994 European polls for the (far-right) Falange Española Independiente party’. ‘The obstructionist position of prior Santiago Cantera won’t stop the process from going ahead,’ it added. The abbey that manages the basilica where Franco – whose Nationalist forces defeated the Republicans in the 1936-9 civil war – is entombed with tens of thousands who died in the conflict, was not immediately available for comment. Many in Spain are repulsed by the existence of the so-called Valle de los Caidos (Valley of the Fallen), where fresh flowers are frequently laid on Franco’s tomb, saying it is the equivalent of a monument glorifying Hitler. Others insist the site, which Franco’s regime built in part with the forced labour of political prisoners in an attempt at reconciliation from the war, is just a piece of history. Socialist Prime Minister Pedro Sánchez, who came to power in June after toppling his conservative predecessor, has made removing Franco’s remains from the site one of his priorities. ‘Something that is unimaginable in Germany or Italy, countries that also suffered fascist dictatorships, should also not be imaginable in our country,’ he said in June. Spanish lawmakers in September approved the exhumation but the family of the man who ruled Spain until his death in 1975 opposes it. They have however said they could be amenable to Franco’s remains being transferred to a family crypt at Madrid’s central Almudena Cathedral. But the government wants them to be relocated to a more discreet spot. The prior’s rejection of the exhumation further complicates the government’s plans. In its statement, it said it planned to go directly to the prior’s superiors with its exhumation request.